RUSH: So now we move on to Kellyanne Conway and the beatdown with Dana Bash. Now, this is interesting because it goes right to what we did on this program last week when we read off all of the conflicts in the media and the incestuous connections in the media. Media people and their wives working for Democrats on the hill, Democrat campaigns, media people leaving journalism and going to work for Obama or some other politician, and those conflicts are never reported, they’re never cited, they’re never mentioned. Hey, Chuck, tell that to all the Republicans you accuse of having conflicts. So what happened here? 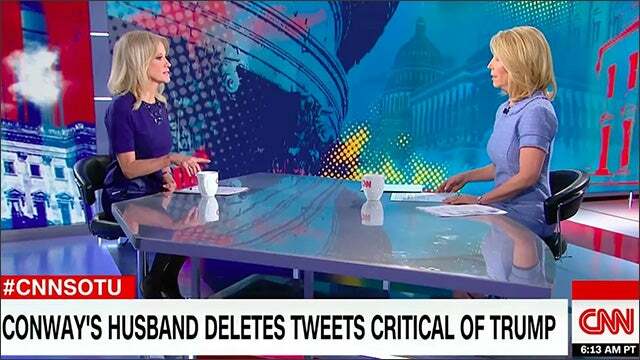 Dana Bash decides to chide Kellyanne Conway about having a husband who tweets critical things of Donald Trump. And so a bridge has been crossed. If Kellyanne Conway’s gonna be asked about her husband’s opinions and she’s gonna have to justify her husband’s opinions, or if she’s gonna have to justify her opinion based on what her husband’s is, remember, it’s Hillary Clinton who says that American women are still under the jackbooted thug boots of their husbands. CONWAY: Two things I’ll say to you. Number one, that, again, that woman who lost the election whose name I never say on TV anymore, is wrong, that women — I think she said white women have to listen to their — the men in their life to form their own political opinions. Wrong again, lady. Number two, it’s fascinating to me that CNN would go there, but it’s very good for the whole world to have just witnessed that it’s now fair… (crosstalk) – excuse me, that it’s now fair game how people’s spouses and significant others may differ with them. I’m really surprised, but very, in some ways, (crosstalk) relieved and gratified to see that. RUSH: Now, Dana Bash is taken aback because Dana doesn’t understand what she did wrong here. She doesn’t understand what Kellyanne could possibly be upset about. Kellyanne’s sitting there for her umpteenth thousandth interview on CNN, and Dana Bash said, “You know, your husband, very respected lawyer.” There’s innuendo there. “Your husband, very respected, your husband doesn’t like Trump. Your husband says absolutely right, Trump’s people don’t like speaking for him because he’s so off the wall he contradicts them. It’s so true. It’s absurd working for Trump. So the husband is brilliant. The husband’s got it all together. Kellyanne has some explaining to do. And Dana Bash doesn’t see that that’s how she set it up. So here’s the next bite. BASH: I would ask you that if you were a man. BASH: A hundred percent I would. BASH: Right. That’s why I was just asking. CONWAY: Oh, no, no, no, you just brought him into this, so this ought to be fun moving forward, Dana. RUSH: Okay. So I guess it means if Dana Bash’s husband disagrees with her, it become news and so forth. Now, the media is reporting that Kellyanne was — I forget how they, I forget the exact words. Well, yeah, they did take that as a threat against Dana Bash, but the media threatens Republicans all day anyway, innuendo and directly. But no, the media’s reporting it as though Kellyanne lost it, Kellyanne got beat to smithereens, Kellyanne was humiliated. I don’t hear it that way. But of course that’s how they would report it.